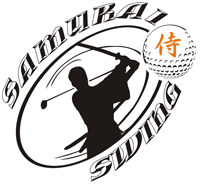 The Samurai Swing- Four Simple Steps to a Great Golf Swing. Golf is all about the Swing. Before you go any further , please watch this video. Then, if you understand that golf is about your swing,about the trust in your swing and the focus on that swing - then you are ready to take the next step. Golf is about harmony of mind , body and movement. Your pure golf swing is a feeling, one that only you can find. The Samurai Swing is a complete swing system that will bring your focus away from hitting the ball and into the feeling of swinging the club. It will focus on 4 simple aspects of golf, using a step-by-step system that you can replicate on every shot, from your driving to your putting. It will remove all the 'fears'and 'voices' in your head that most golfers have before making a swing and replace them with a calm mindset. If you have tried them all , from lessons to DVD's, books , swing aids and more lessons, it's time for something new. It's time for something that works. If you would like to play your golf like this, get in touch. Welcome to the Samurai Swing.